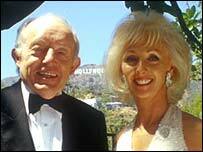 Magician Paul Daniels is out of hospital after collapsing while preparing for a show. The millionaire, 64, was taken ill with a viral infection while preparing to take the stage in Shanklin on the Isle of Wight last week. He had been due to perform his two-hour Audience With Paul Daniels Show at the Portico Theatre. "Paul came out of hospital on Sunday and he is recovering at home," said his agent, Mervin O'Horan. "He's over the infection now but he still needs a couple of days to get back to his old self." Mr O'Horan said that Daniels was planning to return to work at the weekend. "This is Paul Daniels we're talking about," he said. "You can't keep him down for long." A heart attack or exhaustion were suspected when Daniels was first admitted to St Mary's Hospital in Newport, but tests revealed he was suffering from an infection. He had just returned from working in Australia when he was taken ill.
Daniels' wife and former magician's assistant Debbie McGee travelled to the Isle of Wight to be with him during his hospital stay. McGee became Daniels' assistant in 1979 and went on to become his second wife when they married in April 1988.